IF: How do you confuse a guitar player? Put a piece of sheet music in front of him! This picture reminds me of a mythical Greek creature, like the opposite of a centaur. This has a theme of post humanism, due to its use of both human and non-human elements. The addition of the guitar seems to give the picture a soothing feel. Well drawn with charcoal. Enough detail to understand whats happening. I agree with andrew. Very evocative of Greek and Roman mythology. The guitar definitely adds a whimsical quality which adds to your drawing's appeal. Very moody piece. I like it very much. This portrait relates to the post-human theory we discussed in class. The post-humanism is demonstrated by the horse's head on the human body. Also i like that the horse/man is playing guitar, to me it shows that even though the individual is post-human, they are still capable of normal human activity. In addition to that, this example of post-humanism is different from my usualy stereotype of post-human beings, which is that they are more advanced and intimidating. This piece seems to bring about feelings of post-humanism. The horse seems to become part of the guitar. The being also appears to have human hands. Thus suggesting that it is post-human. Very interesting piece! This piece seems to spark feelings of post-humanism. The horse seems to take on characteristics of a couple of different things. The horse is one with the guitar. The horses hands also resemble those of a human being thus verifying post-humanism. I think this is a very interesting picture and it has a strong post-humanism theme. I think it is interesting because normally a horse and human are in the form of a centaur, but this picture is the opposite with the horse head and neck on a human body. The way that he is posing and jamming on the guitar is very rock star which makes it sweet. The way that the figure mixes human and animal like characteristics demonstrates post humanism. I like how the guitar demonstrates that even post human creatures can still act in human ways. I agree with many of the other students comments when I look at this picture. The post-humanism theme is very obivious to me when I look at it. The human element of the strong man mixed with the animal element of the powerful horse makes the character seem very intimidating and unaproachable. The horse being present as the head rather than the body is opposite to what we normally see when these two are crossed. By having the character playing a guitar adds to the idea of the post-human character being not aproachable beacause we tend to think of musicians as being on a higher level than the everyday person. Yeah I see the post human element. Hands of a human and body of a horse but beyond that I see some influence by the Birmingham School. To me this painting shows that the only way to get past our "cookie cutter" Music is to do something outrageous. Like i don't know, a horse playing a guitar. Very cool, I'm involved in music so I could relate to this one. In this picture I see it as a post-human picture, the body is of a human but the head is a horse. I feel that it shows that animals can have some human characteristics in themselves. I think that the horse also shows power because musicians have a great deal of power to influence the people that listen to them. I would have to agree with all the other comments on how this painting shows post-humanism. 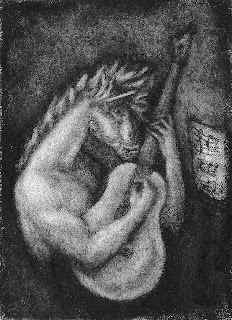 I feel that this shows these qualities because the figure playing the guitar has the head of a horse, which is nonhuman, but the body continues to become more human-like as it reaches the arms. Also it is doing an activity that only a human can do, such as playing the guitar. I thought this was an interesiting painting and that it definitely goes along with what we learned in all of the Alien films. This picture is relevant to many of the things we discussed in class. During the Alien movies we talked about post humanism. This picture has many post human elements. There is the body of a man and the head of a horse. The alien in the movie was also post human with many human and non human elements. I feel like this could be an actual portrait of somebody (or something), and I feel bad for him. I believe the drawing has a sad feeling to it. It is post human with the horse and human. Also I think it is trying to show the power of a musician. Not only is a horse a very powerful creature, but the human body looks very muscular. It shows how with only a guitar a musician has the power to control the thoughts of so many people. I think that this is a really neat picture. It has of course post human elements with it having both human and and non-human features. This picture is very easy to look at and makes you think a lot about how it is a horse head and human male body. It fits that the arms in this photo are strong because it links it to how a horse is as well. This painting i choose to write about because it caught my eye. I found the horse very interesting and post human came to mind as soon as i saw it. This picture definitely reminds me of post-humanism as the horse has human elements of playing a guitar. It really brings out elements of human characteristics in the picture. It almost gives the horse a personality, I like it. Beautiful imagery for a hard IF prompt! Great job!